Downton Abbey is so refreshing to hear as well as to watch. It’s the writing! It’s good dialogue. The actors can hardly discharge good lines if they aren’t any good when written. Thanks to Julian Fellowes we hear good lines…..and thanks to Maggie Smith, of course. The Dowager Countess character puts me in mind of an earlier writing extraordinaire of Fellowes’, Gosford Park . Countess Trentham, snobbish aunt of Lady McCordle, played superbly again, by Maggie Smith. She has the best lines in the movie. Well, among the best. Fellowes declares that he fashioned her after an aunt of his own. It is a movie I have watched many times because of the good writing; the subtle hints to dwell on, trying to figure it all out. After I did figure it out and I knew what was coming next, I still enjoyed it because good acting follows good writing. If you want to search and enjoy more of Julian Fellowes, check out Monarch of the Glen. He acts resplendently as a delightful character in the series from 2000-2005. No, that is not a picture of Downton Abbey. 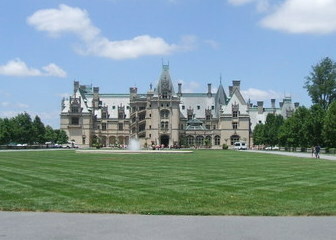 It is America’s Castle, the Biltmore, former home of George Washington Vanderbuilt in Asheville, North Carolina.